New company Data Centred, who provides computing and cloud computing services, was setting up in a 32,000 sq ft unit near Media City in Salford Manchester. 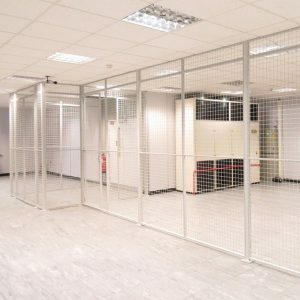 AMP Wire received an enquiry asking if we could help them by supplying and installing wire mesh cages as enclosures that could protect their data servers and fibre optic inlets and outlets. Always pleased to help, we sent our guys along to conduct an on-site survey. After all the measurements were gathered, we set to work designing the most suitable wire mesh enclosures for the job. Once designs were approved, it took our guys four days to manufacture all five of the mesh enclosures, measuring up to 6.5m x 5.2m in size, in our factory; a quick turn around by anyone’s standard. On a bright sunny day, Matt, Phil and Wes (aka The Three Amigos) set off to Salford with a truck load of wire mesh enclosures all ready for installation. The job went according to plan with not a single problem and after much hard graft the job was complete. 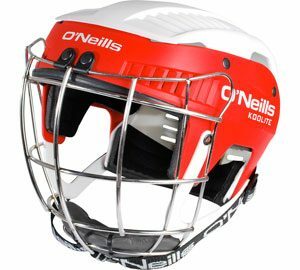 When O’Neills Sport was designing helmets for Hurling, the world’s fastest field game, they knew they needed a wire face guard that allowed as much visibility as possible, whilst standing up against a hundred mile-per-hour sliotar to the head. We worked closely with the helmet’s designers to meet their needs. We used stainless steel wire to create a frame that was lightweight, non-obstructive and durable. Our wire can be seen on the entire range of O’Neills Hurling Helmets. Complete Welding Services; who offer nationwide repair, inspection and maintenance of welding and cutting equipment, got in touch with us to ask if we could manufacture a gas cylinder cage to replace an old and rusty one. Using more gas bottles that a lot of companies, our standard gas cylinder cages just weren’t big enough so, Nialle Evans approached us for something bigger! The Gas Cylinder Cage was to replace a rusty one located outside in their yard so their engineers could still have out-of-hours access to gas bottles; the cage also needed to be securely locked to ensure both safety and security. We sent Matt (our Works Manager) along to measure the area and propose the most cost effective option. As our flat-pack standard partitioning and enclosure panels fit together easily to create partitioning, or any size or shaped enclosure with a security roof, this would prove to be the best solution. 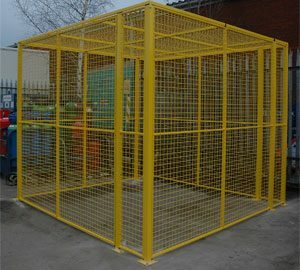 The Complete Welding Services enclosure is a 3m x 3m x 3m cage made up from AMP Wire’s standard wire mesh panels with a zinc undercoat and a yellow powder coat top coat; to ensure it stands up to Manchester’s wet weather. 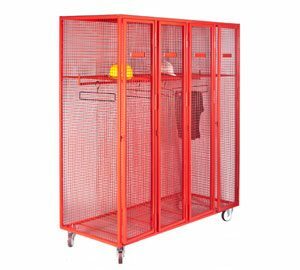 It was assembled on-site creating a secure cage with roof and double, full height doors to allow for easy access whilst also being secure. The Benjamin Rabbit Day Nursery was nearly ready to open its doors: With safety paramount, they sent an enquiry to AMP Wire for the supply and installation of Pipe and Radiator Guards. We sent our guys to Chatham in Kent to measure all 25 of the radiators and conduct a thorough survey of the eight rooms and over 60 meters of pipe work, prior to installation. Wire Mesh Pipe and Radiator Guards can be manufactured to any size and in various shapes in order to protect anyone, especially children, from suffering an injury by accidentally falling on hot radiators or pipes. Our installation team arrived on site on the agreed date. 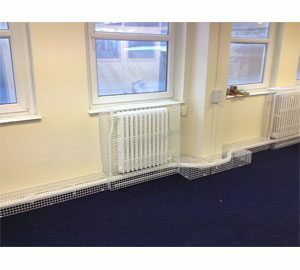 The Radiator Guards at the children’s nursery were installed, the client was happy, job done. Ken Blake, the regional property Manager for the West Scottish Fire and Rescue Service spoke to AMP Wire as they had a requirement for fire service lockers. Having looked online he could only find suppliers in America, so was pleased to learn that we are a UK Manufacturer. Having sent through the required specification AMP Wire’s design team were able to produce a design that would work for all within the West Scottish Fire and Rescue Service. Having produced a prototype for them to try and after a few minor tweeks AMP Wire got the go ahead. After the first initial order, Ken and the team were so happy with the lockers they ordered again for the staff at the 2012 Commonwealth Games. “When the Scottish Fire Service centralised in 2012 we looked to invest in new lockers for fire fighters’ Personal Protective Equipment (PPE). We were able to work up a sample locker unit with our staff on site and AMP Wire’s design team, the sample was adjusted and approved; we were then in a position to place orders for Alloa and Stirling fire stations.